It's always nice to get a thank you note, it's like a little validation of good that you've done in the world that someone has taken the time to formally thank you. The little warm and fuzzy feeling may not entirely offset the disappointment of losing an election to Donald Trump, but it's better than nothing! 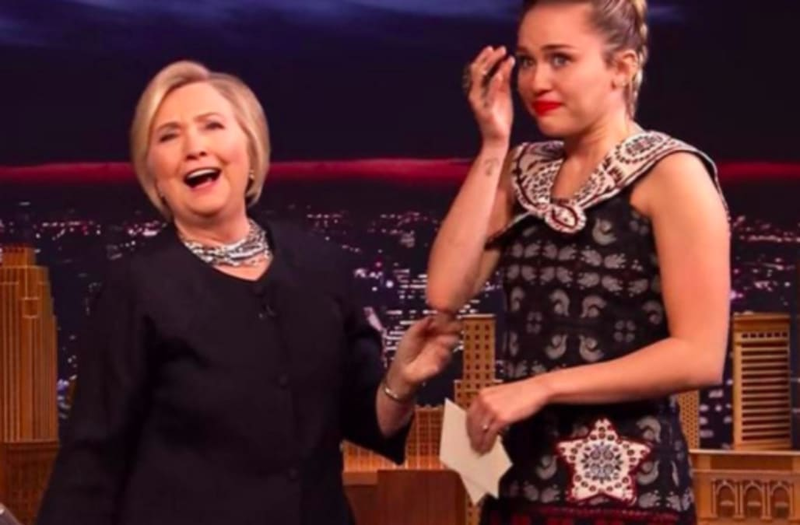 Hillary Clinton went on The Tonight Show starring Jimmy Fallon yesterday and the female writers of the show wanted to show their gratitude to the former presidential candidate. They read out thank-you notes to her along to appropriate "thank-you note writing music." Being comedy writers, they were pretty funny, with one of them telling Clinton, "Call me day or night and I will be there with a gallon of ice cream and two spoons to tell you, girl you are so much better than him!" Once the writers were done it was Miley Cyrus' turn, and she took a pretty sincere tone, seeming to choke up with emotion as she thanked Clinton for being "a beacon of strength," before giving her a teary hug. Finally, Clinton herself started on her own thank-you note to "all the women and young girls out there" telling them "you are smart, strong, and deserving of every opportunity." She ended the note on a quote from Miley Cyrus: "We can't stop, and we won't stop." Miley Cyrus and Demi Lovato released new albums on the same day. Was it a coincidence?